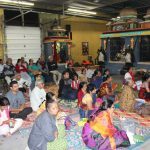 By the immense grace and compassion of Sri Guru Maharaj and Thakurji, Orlando GOD Satsang was blessed to attend “Saptaham on “Sri Krishna Leela”. 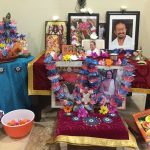 Sri Poornima ji showered blissful leelas of Krishna over 7 days; the katha was conducted at Casselberry Hindu temple in Orlando from September 20-26 2017. The first day of the event started with a prayer to Lord Ganesha and Madhura Geetams sung by Orlando GopaKuteeram kids. Then Poornimaji started the first day of katha, which prepared devotees with necessary background information on the early chapters of Srimad Bhagavatam. Day-2 also began with Madhurageetams followed by Sri Poornimaji’s discourse. She highlighted on few bhakta charitras and their devotion to the Bhagavan Sri Krishna. She also mentioned several quotes of great mahans and from Bhagavatam on why Krishna is the Supreme Lord! On day-3, after Madhurageetams were sung by Orlando GK students, Sri Poornimaji started Canto 10 and described beautifully how Lord Krishna was born. 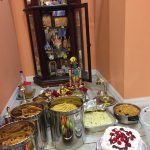 After the katha, Orlando GOD was blessed to celebrate the birth of our little Krishna by playing dandiya and circumambulating around the Lord. On day-4, after few Madhurageetams, Orlando Gopa Kuteeram kids performed a dance program which highlighted some of the leelas of Sri Krishna. Kids and parents enjoyed the dance program. 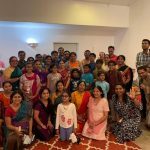 Sri Poornimaji continued with her talk and beautifully described how Gokula vasis welcomed baby Krishna and how little Krishna gave mukthi to several asuras including Puthana,Tadakasura, Trinavarta and others. She also emphasized that although the asuras came to harm little Krishna, He the most compassionate granted them liberation. 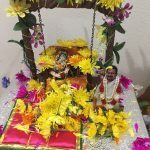 On Day-5 and Day-6, Sri Poornimaji resumed her katha after GK kids sang few Madhurageetams. She drenched all devotees with her beautiful and blissful account of Krishna’s Maakhan Chor Leela. All the devotees were spellbound and were mentally transported to Gokula. In addition to narrating each leela, Sri Poornima ji also explained the insight of it. She said that the Lord loves devotees that have a heart as white and soft as butter. in Orlando. Around 45 people attended the katha everyday.